Simon & Schuster/ TED, 9781501161766, 368pp. 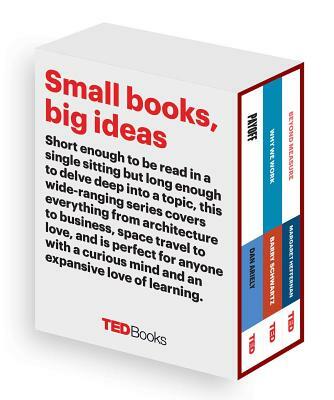 Powerful, timely messages collected in one convenient boxed set, an illuminating must-read from three of the leading business minds of our time and renowned TED speakers—Dan Ariely, Margaret Heffernan, and Barry Schwartz—that offers expert insight into our current economic times. Payoff: The Hidden Logic That Shapes Our Motivations investigates the true nature of motivation, our partial blindness to the way it works, and a journey to try and bridge this gap. From the Zappos boardroom to a child’s allowance, Dan Ariely digs to the root of money motivation—how it works and how we can use this knowledge to approach disparate choices in our own lives. Along the way Ariely explores complex questions like why are we willing to part with money in some occasions and not others? Is it a good idea to try to motivate children by giving them money to do chores? When are bonuses most effective at work? In Beyond Measure: The Big Impact of Small Changes, business leader Margaret Heffernan looks back over decades spent overseeing different organizations and comes to a counterintuitive conclusion: it’s the small shifts that have the greatest impact. From the CIA revolutionizing their intelligence gathering with one simple question, to an organization increasing their revenue by 15 million by instituting a short coffee break, Heffernan investigates all these scenarios and comes to the same conclusion: big improvements can come from simply making small changes. If the reason we work is primarily for a paycheck, why are so many people dissatisfied with their work, despite healthy compensation? And why do so many people find immense fulfillment and satisfaction through “menial” jobs? In Why We Work, Barry Schwartz takes us through hospitals and hair salons, auto plants and boardrooms, showing workers in all walks of life, highlighting the trends and patterns that lead to happiness in the workplace. Ultimately, Schwartz empowers us all to find great work by proving that the root of what drives us to good work can rarely be incentivized, and the cause of bad work is often an attempt to do just that. Barry Schwartz is a professor of psychology at Swarthmore College and the author of Why We Work, The Paradox of Choice, and Practical Wisdom. His articles have been published in The New York Times, The New York Times Magazine, the Chronicle of Higher Education, Parade Magazine, USA TODAY, Advertising Age, Slate, Scientific American, The New Republic, Harvard Business Review, and The Guardian, and he has appeared on dozens of radio shows, including Morning Edition, Talk of the Nation, Anderson Cooper 360, and CBS Sunday Morning.